Damascus (Agenzia Fides) - A delegation of Russian parliamentarians visiting the Middle East was received in Damascus by Patriarch Yohanna X, Primate of the Greek-Orthodox Church of Antioch. During the meeting - according to Russian sources quoted by Interfax agency - the Patriarch expressed gratitude for the role carried out by Russia in the scenario of the Syrian conflict. "What Russia, the people of Russia and the Russian Church are doing in Syria" said Yohanna X "aims above all to help the people of Syria, and to bring peace to Syrian land". The Patriarch also expressed his profound regret for the controversies that arose between the Orthodox Churches - and which see in particular the Patriarchate of Moscow and the Ecumenical Patriarchate of Constantinople - around the granting of autocephaly (full independence) to a national Orthodox Church in Ukraine (which the Patriarchate of Moscow considers as its "canonical territory"). "We strongly oppose to what is happening throughout the Orthodox world, which aims at dividing and weakening the Orthodox Churches", said Patriarch Yohanna in his talks with Russian parliamentarians. The Russian delegation included Dmitry Sablin, coordinator of the friendship group of the parliaments of Russia and Syria, Sergey Gavrilov (president of the parliamentary committee for the development of civil society) and Dmitry Belik, deputy of the Duma of Sevastopol. 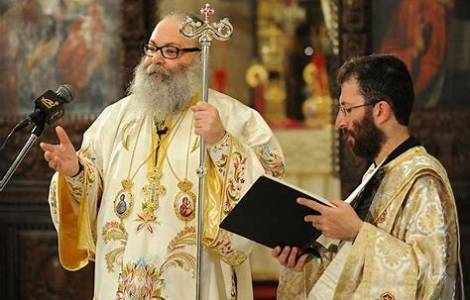 Last November 17, as reported by Agenzia Fides (see Fides, 19/11/2018), a qualified delegation of the Patriarchate of Moscow took part in the meeting convened in Damascus by the Greek Orthodox Patriarchate of Antioch, which also saw the participation of Syrian politicians and a large representation of representatives of the local Sunni Islamic communities.